With the edited collection Landscape and Race in the United States, Richard Schein aims to get the reader thinking about the relationship between race and the cultural landscape of everyday places; following Toni Morrison, he argues that “all American landscapes can be seen through a lens of race, all American landscapes are racialized. For Schein and his contributors, cultural landscape is material, visual, and epistemological, and landscape itself is a process: we shape it to reflect our cultural values, and then the cultural “framings” it contains come back to shape culture, so that whether material or symbolic, “cultural landscapes are constitutive of the processes that created them in the first place.” Further, following Cornel West, Schein argues that race is an anti-essential, social, and political construct that “matters” as if it were ontological. Examining race in the landscape allows us to understand, in Omi & Winant’s worlds, “the sociohistorical process by which racial categories are created, inhabited, transformed, and destroyed.” In other words, studying racialized landscapes can help us understand the process of racialization. Schein prescribed a pretty specific research agenda for his contributors, which means the book is tightly argued even if not all the essays are directly comparable. Topics and authors include: Michael Crutcher on generational differences and segregated landscapes in New Orleans; Steve Hoelscher on Natchez, Mississippi and the erasure of “Forks in the Road;” Samuel Dennis on the reconstruction of a South Carolina plantation as a tourist site, from the points of view of the planter, slaves, and free blacks on the land; Gareth Hoskins on Angel Island and Chinese Immigration; Daniel Arroya on racial stereotyping in turn-of-the-century picture postcards of impoverished Mexican families; James & Nancy Duncan on aesthetics and the battle between white and Central American residents of Mount Kisco, New York; James Rojas and “Latinoization” in the creation of the East LA vernacular landscape; Jonathan Lieb and the attempt to put Arthur Ashe on Richmond, VA’s Monument Ave; Derek Alderman on MLK streets; and Heidi Nast on the relationship between race and the location of dog parks in Chicago. This collection is valuable both for its wide variety of geographic locations and its work in opening up discussions of race beyond the black/white binary. It’s also wonderfully readable. This entry was posted in Cultural Geography, culture, history, landscape, process, race, vernacular on April 10, 2013 by Kirsten. In Landscape and Memory, Simon Schama argues that “even the landscapes that we suppose to be most free of our culture may turn out, on closer inspection, to be its product,” and that this mutually constitutive relationship between nature and culture is “a cause not for guilt and sorrow but celebration.” Accordingly, while Landscape and Memory digs deep into the histories of a wide variety of landscapes, Schama’s is an “archaeological” method rather than a critical one. His goal is not to expose capitalist exploitation in the landscape but to dig deep “below our conventional sight-level to recover the veins of myth and memory that lie beneath the surface.” By situating landscape myths in their historical-cultural moments, Schama shows how socially-constructed meaning and memory become embedded in a landscape. Schama applies his archaeological approach to a variety of landscapes: the primordial Bialowiez forest in Poland, which the Germans wanted to raze and replace with “a great, living laboratory of purely Teutonic species: eagles, elk, and wolves” (and bison) during WWII, because it was the symbolic and heart of Poland; Gianlorenzo Bernini’s Fountain of the Four Rivers in Rome as an embodiment and co=optation of the ancient obsession with circulation and flow; Mount Rushmore and sculptor Gutzon Borglum’s obsession with dominating nature by carving human heads into stone; and “both kinds of arcadia, the idyllic as well as the wild,” as escapist “landscapes of the urban imagination,” responding to cities by providing pandemonium when cities are too ordered and bucolic countryside when cities are too chaotic. Throughout, Schama relies on a narrative form to weave many disparate threads into each chapter’s coherent whole. This book is neither a call to action nor a complete history of particular places nor even a landscape study; it’s more of a literary exploration into the layers of myth and memory that make up a landscape, arranged by a subjective narrator into layers of his own choosing. 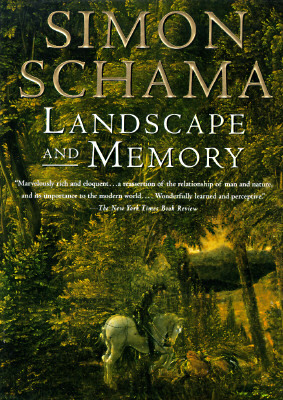 While it’s a lovely read, it does make me wonder whether Schama thinks the physical landscape needs to be there at all. This entry was posted in archaeology, constitutive outside, Cultural Geography, discourse, landscape, literature, memory, myth, narrative, social constructivism, subjectivity, symbolic on April 9, 2013 by Kirsten. the “morphological method” involves describing the hell out of physical and cultural landscapes, and then looking for formal patterns across landscapes to determine the connections between culture and the landscape. The goal is to create composite types, so that you can measure future landscapes against them. Geography is not an abstract, rational science; it accepts the subjectivity of the geographer, as long as that subjectivity is made somewhat objective by long experience with reading and writing patterns in the landscape. 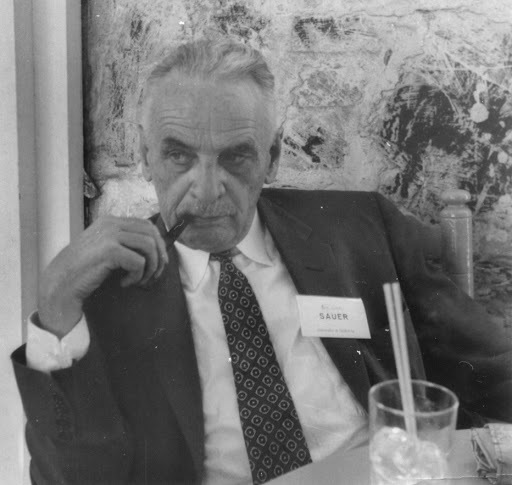 I realize that there was a pretty fierce debate in the 1990s over whether Sauer’s theory of culture was “superorganic,” or a force independent of humans. There is one paragraph in this whole essay that alludes to a superorganic theory of culture in here, but I think that the problem is more that cultural theory was a lot more complex in the 1990s than it was in the 1920s than that Sauer thought culture was an autonomous force. He was trying to shift the geographical paradigm away from environmental determinism, not invent a spatially-informed theory of culture in the process. This entry was posted in area, Cultural Geography, culture, empiricism, history, landscape, morphology, nature, objectivity, Sauer, subjectivity, superorganic, typology on April 9, 2013 by Kirsten. 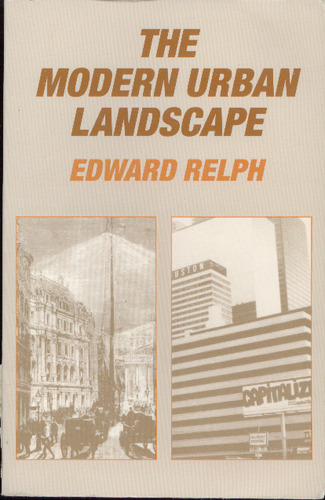 Edward Relph’s The Modern Urban Landscape examines the landscapes of large cities since 1880 for clues as to the relationship between modernization and urban form. In particular, he studies the visual landscapes of the “modern parts of towns and cities” in North America, Britain, Europe, Australia, and New Zealand; building on this firsthand experience, he concludes that “the modern urban landscape is both rationalised and artificial, which is another way of saying that it is intensely human, an expression of human will and deeply imbued with meaning.” He thus shifts the focus of human geography from the rural to the urban, while retaining the discipline’s focus on empirical observations of coherent visual landscapes. To collect data on the changes in urban architecture, planning, technology and social conditions since 1880, Relph takes the “geographical” approach of “watching:” he starts with “the totality of what I see,” then follows “several directions more or less at once,” looking for unusual details, new developments, and ironic juxtapositions within the larger context of the urban fabric. Landscapes, to Relph, are the “visual contexts of daily existence,” and he insists on retaining the wholeness of the urban landscape because so much of landscape is about context, about the relationships between buildings and the streets and spaces and other structures around them, that you cannot study any one element in isolation. Only by preserving landscape’s “fragile wholeness” can we hope to learn anything about how it functions. a “conviction in the merits of self-consciousness:” “everything now is subjected to cool analysis and technical manipulation, leaving little room for the traditions which stood behind most preindustrial landscapes.” Elements of landscapes, from buildings to parking meters, follow an increasingly rationalised and institutionalized (and specialized) process, so very little building happens in a vernacular sense. While Relph retains human geography’s emphasis on the coherent “fragile wholeness” of landscape, he also discerns power differentials and the impacts of capitalism on the landscape. While he needs to work on his positionality (he argues at one point that everyone in cities works a sedentary job), I suspect this use of social theory is Relph’s way of making a few plastic flowers of his own. This entry was posted in Cultural Geography, history, human geography, illusion, Information Age, landscape, Machine Age, Modernism, modernity, new cultural landscape studies, PoMo, power, urban on April 9, 2013 by Kirsten. In The Lie of the Land: Migrant Workers and the California Landscape, Don Mitchell uses labor history, critical social theory, and cultural landscape studies to reveal the “connection between the material production of landscape and the production of landscape representations, between work and the ‘exercise of the imagination’ that makes work and its products knowable” in the construction of California’s agricultural landscape. In doing so, he argues that the “struggles over the form that the reproduction of labor power in industrial agriculture would take” ultimately shaped the landscape. However, landscape is ideological in that it tends to “erase the politics and actuality of work from the view” (Cosgrove) and naturalize capitalist concepts like property and land ownership. Therefore, the critical project of The Lie of the Land, to “understand the interplay between production and representation of landscapes, while at the same time restoring an ontology of labor to the center of landscape geography and history,” is a political project. Labor history and landscape analysis can both explain each other because landscape is a particular kind of space, one that includes construction, representation, and lived experience; the making of landscapes is thus both a geographical and a cultural enterprise. Further, landscapes associated with the geography of labor are created and maintained through contestation: labor is required to create them, and where there’s social organization, there are power relations and conflict. If agriculture in California has long been represented as the promised land, an Edenic paradise wholly divorced from labor, in actuality it is the product of ongoing struggle between capital’s desire to properly reproduce labor power and labor’s desire to “resist their constant objectification and marginalization.” What we see is an always-changing, partial resolution to the struggle. Mitchell pursues the laboring of the California landscape through a wide variety of contexts: Steinbeck’s The Beautiful and the Damned; the Wheatland Riot; the “subversive mobility” embedded within the migrant labor force; ideologies of race and gender that whites use to justify paying non-white workers lower wages; the Workers’ Revolt of 1933, in which workers radicalized and attempted to reshape the landscape; and the post-WWII increase in state surveillance of agricultural labor, which enforced better wages and living conditions by way of precluding future revolts. In conclusion, Mitchell argues that rather than support representations of California’s agricultural landscape as a smooth, cohesive whole populated with anonymous, happy workers, migrant workers have to fight their own aestheticization and disrupt the landscape. Mitchell, for his part, hopes that this history of agricultural labor struggle will disrupt the “lie of the land” by providing insight into the violence and exploitation that created it. This entry was posted in aesthetics, agriculture, capitalism, critical human geography, Cultural Geography, exploitation, ideology, labor, landscape, narrative, seeing, struggle on April 9, 2013 by Kirsten. The Interpretation of Everyday Landscapes: Geographical Essays is a collection of landscape studies edited by DW Meinig. It represents a conscious effort to complicate the cultural landscape and reclaim it from the abstractions of science, in a way that both respects the visual nature of landscape and takes advantage of its discursive possibilities. In his Intro, Meinig defines an ordinary landscape as a continuous surface created by and through the “routine lives of ordinary people.” But it’s also not that simple: landscape is a coherent unity of physical, biological, and cultural features; it has both functional and aesthetic components; it is more visual and panoramic than an environment, but less subjective and experiential than a place; and it is both a geographical formation and a representation, a history and a text, a symbol and an accretion of meanings. Landscape is both space and meaning; it doesn’t exist without interpretation. Peirce Lewis argues that “our human landscape is our unwitting biography, reflecting our tastes, our values, our aspirations, and even our fears, in tangible form,” and that “like books, landscapes can be read, but unlike books they were not meant to be read,” so we have to teach ourselves to see. Meinig uses “ten versions of the same scene,” which progress from pure, “unconstructed” nature to pure aesthetics, to show how landscape is “composed not only of what lies before our eyes but what lies within our heads,” and that it therefore “deserves the broad attention that only ordinary language allows.” He also, in another essay, discusses symbolic landscapes as an iconography of nationhood. Marwyn Samuels discusses authorship of the landscape and the difficulty of finding the voices of the people who created the landscape when the masses leave no signature. While these essays do not complicate culture as much as we would expect in 2013, they do complicate landscape, showing it to be both temporal and spatial, objective and subjective, material and symbolic, and individual and collective. That it is consistently a visual, discursive space speaks to their own debts to JB Jackson and his version of cultural landscape studies. This entry was posted in Cultural Geography, discourse, history, landscape, meaning, memory, objectivity, preservation, space, subjectivity, symbolic, text, visual space on April 9, 2013 by Kirsten. Horowitz writes in her introduction that Jackson’s two main purposes are to discover the American (cultural) landscape and to compare it with the landscapes of Europe. She implicitly raises a host of questions that Jackson addresses in his work – is there a distinctly American landscape? If there is, what makes it distinct, and why is it different? What does this landscape say about American culture? I like that she situates his work within the physical landscapes of Europe and America, but I suspect the ideological landscape (not that Jackson would like that use of the term) in which he was writing influenced him at least as much as the physical. His work in landscapes belies a deep interest in culture and politics, showing him to be just as interested in ideas as he was in his physical surroundings. Situating him within cultural theory lends his interpretations of American landscapes a decidedly democratic bent. After WWII, Adorno was interpreting fascism and the Culture Industry; Reisman bemoaned the “other-directed man;” Orwell and Bradbury and Huxley were drawing out totalitarian governments to their logical ends. Conversely, Jane Jacobs was lauding the “eyes on the street,” David Potter was celebrating the “land of plenty,” and Kerouac was rejecting ideology in favor of personally experiencing reality. Like the latter three, Jackson favors the material, the physical, and the creation of culture by both government and people. He uses front yards and highways and garages to examine the interplay between top-down and bottom-up theories of culture in the same way that Jacobs uses New York or Kerouac uses San Francisco. His arguments – that landscapes can and should be interpreted culturally and that the vernacular, the pragmatic, the environmentally or temporally contingent has at least as much to do with their development as the ideology of architects and government planners – indicate a faith in the American people to create a landscape that is uniquely, well, American. Key to Jackson’s argument, I think, is that planned and vernacular development interact to create cultural records on the American landscape. His articles reveal vestiges of the Turner thesis, of a faith in American individual enterprise, of the importance of perspective, of the twin foci on desire and commercialism that underpin the development of the landscape as he sees it. His emphasis on the physical lends itself to an interpretation of the cultural, and he embraces popular culture and leisure (rather than work or city planning) as driving forces in American cultural landscapes. He simultaneously encourages objectivity in defining the landscape and subjectivity in interpreting it. While I don’t particularly think that highways, suburban sprawl, or mobile homes indicate much individual agency, I really like that Jackson still looks for that agency, still teases out that element of personal desire and emphasizes its role in the creation of the landscape. His faith in individual agency and the vernacular contrasts with the more structuralist(?) approaches of people like Adorno and Don Mitchell in a very welcome way. Today, I would only add two things: an emphasis on empirical observation of landscapes as a primary way of collecting information about them, and a definition of landscape that makes it both visual and discursive, a text whose meanings can be divined by looking. This entry was posted in agency, Cultural Geography, discourse, empiricism, exceptionalism, JB Jackson, landscape, objectivity, perspective, seeing, subjectivity, text, vernacular on April 9, 2013 by Kirsten.